In this case, the right people are those organizations who are not under “formal investigation for financial or administrative improprieties by local, state or federal authorities,” reports Jeffrey Goldberg of The Atlantic. On the surface, this sounds like a reasonable policy. Why would anyone want to fund questionable organizations? However, Goldberg’s probing reveals a political agenda. Indeed, this decision was about severing ties with the most important provider of reproductive health services in the United States. These services, of course, include abortions, and Komen finally decided to veer openly to the right on this controversial issue. Komen applied its new policy to PP, which has been the target of a congressional inquiry since September because, according to Representative Cliff Stearns (R), the organization might be using federal funding to pay for abortions. Often, media analysts point out that the power of social media lies in its ability to organize dissenters. However, we should also look at social media’s ability to aggregate discontent. Indeed, we can’t think of this backlash as the result of an organized effort. We should look at it as the result of decentralized actions that coalesced because of social media. We use the social web to connect with each other, but connecting isn’t just about sharing pictures of our pets. We share information, we comment on Facebook pages, we use hashtags, and we spread of memes. The savviest organizations and individuals know how to channel these routine activities into movements. Yet what the organizers of virtual protest really do is guide our clicks in the desired direction. That’s very different from asking us to occupy a public park. Clicking, using a hashtag, signing a petition, changing our profile picture, or sharing a picture costs us very little effort, yet the cumulative effects can be very powerful. 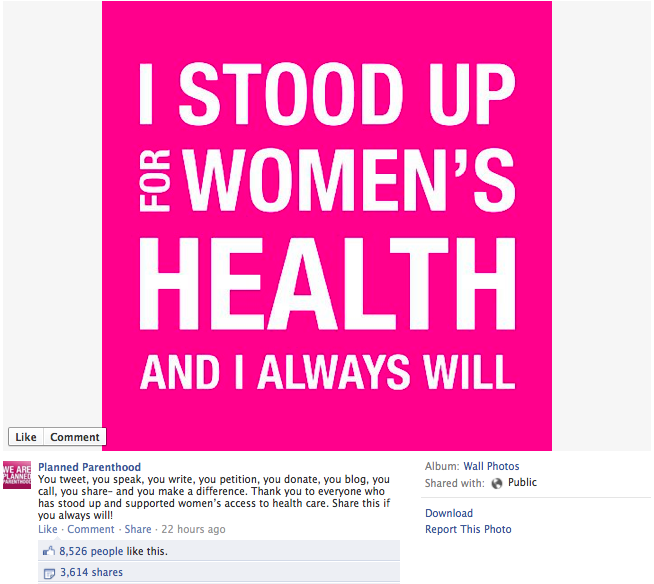 Planned Parenthood understood this much better than Komen. 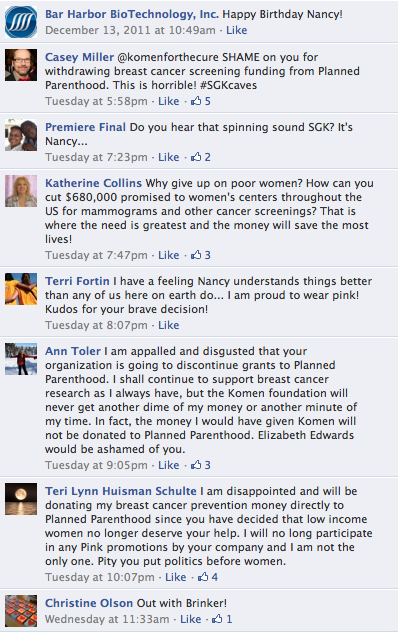 In comparison, what was Komen doing with their social media? According to Kivi Miller, during the initial stages of the crisis, “The only Komen action on their Facebook page had been to delete anti-Komen comments, so the ratio of negative to positive looks more like 10 – 1 instead of the 80 – 1 (and even higher this morning) on Twitter.” Aside from that, Komen carried on as it would under normal circumstances. For example, as Miller noted, Komen re-tweeted a report from FoxNewsLatino on January 30. Komen did not address their funding decision on Twitter until February 1, when they released Nancy Brinker’s video statement (posted above). Worst of all, Komen’s Twitter feed today had been dedicated to debunking a supposed partnership with Discount Gun Sales, to market pink handguns for the cure. 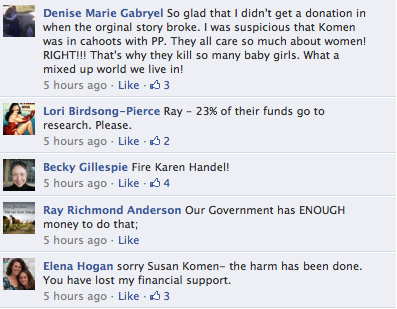 Now that Komen has reversed its funding decision, they will have to re-build their brand. The damage is significant, judging from some of the reactions posted to their Facebook page. The damage has nothing to do with breast cancer, or Komen’s mission. It has everything to do about their abandoning their primary focus, breast cancer prevention, awareness, and funding for research. 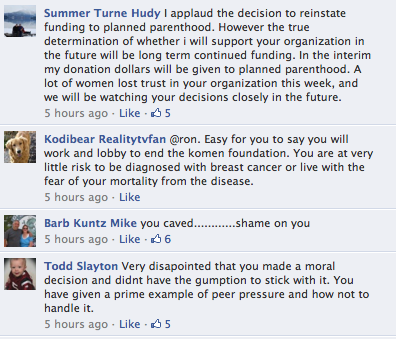 Before the PP debacle, I counted Komen as one of the savvy organizations. 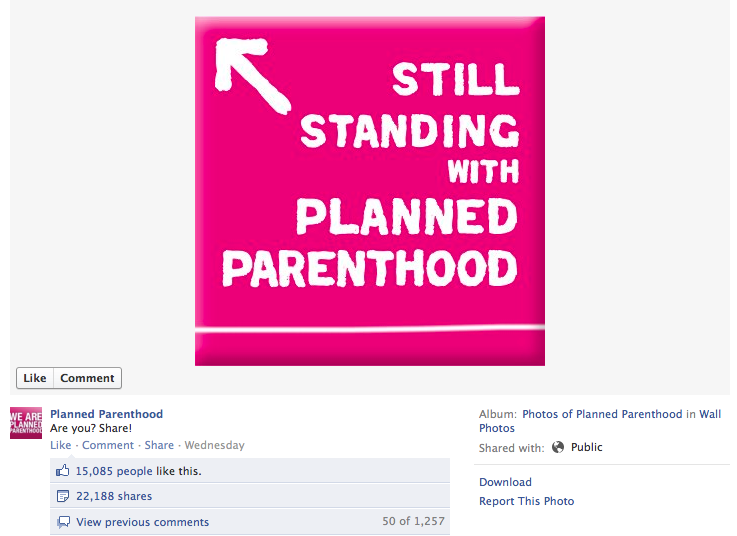 Their pink ribbon campaigns and partnerships were Facebook darlings. In fact, you could say that Komen took Facebook Pages best practices guide to heart. It uses its page to “join the conversation, share their stories, and build a meaningful dialogue with their supporters and volunteers.” Unfortunately, Facebook’s handy guide doesn’t address the other side of the meaningful dialogue, the fact that it is public, and that involves people, not sheeple. The lesson here is that one should never assume “Facebook Likes” mean complete agreement with every policy decision. This entry was posted in PR, social media and tagged facebook, nancy brinker, Planned Parenthood, representative cliff stearns, social media, Susan G. Komen, Twitter. Bookmark the permalink.